Home » All Forums » [Regional Forums] » Where Should I Eat? 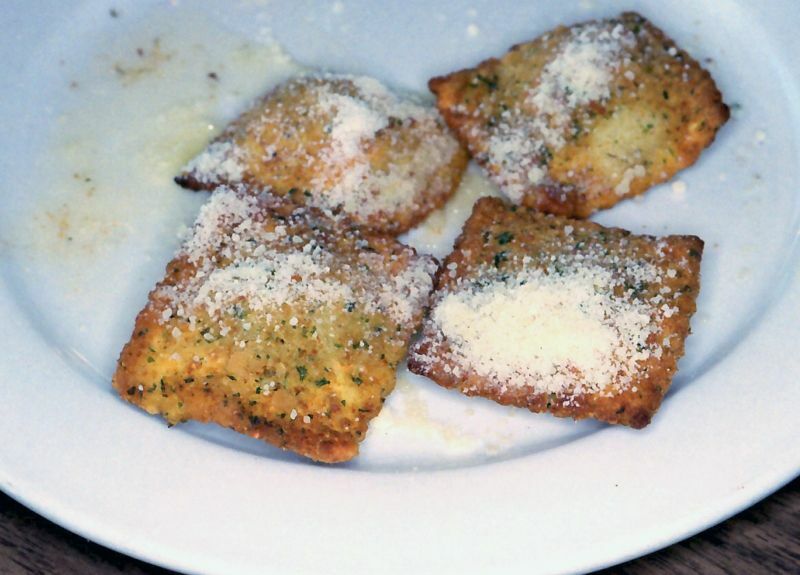 » Italian food in St. Louis Missouri? 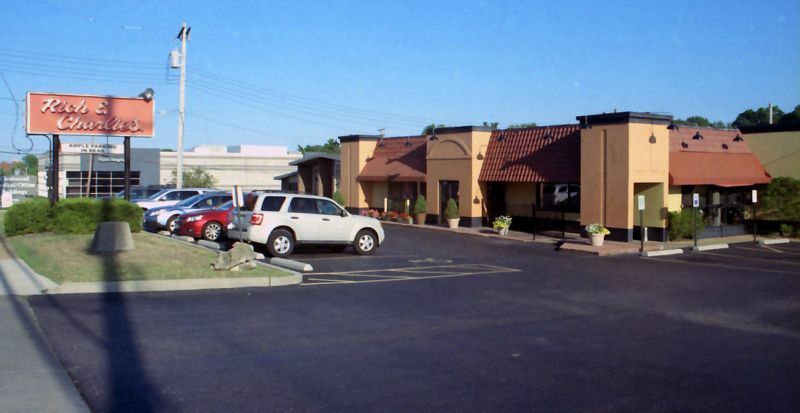 Italian food in St. Louis Missouri? 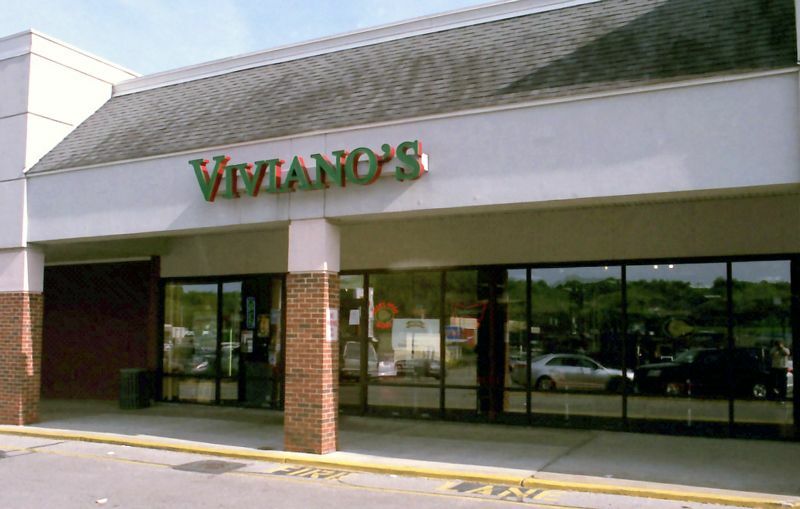 But I think a big treat is to go to Viviano's grocery on The Hill. As it says, "The smells are free." It's been there since the late 1940s, the staff is helpful, and the prices on Italian staples are excellent ($9 for a liter bottle of cold-pressed extra virgin olive oil, for example). It makes its own Italian sausage and pasta. 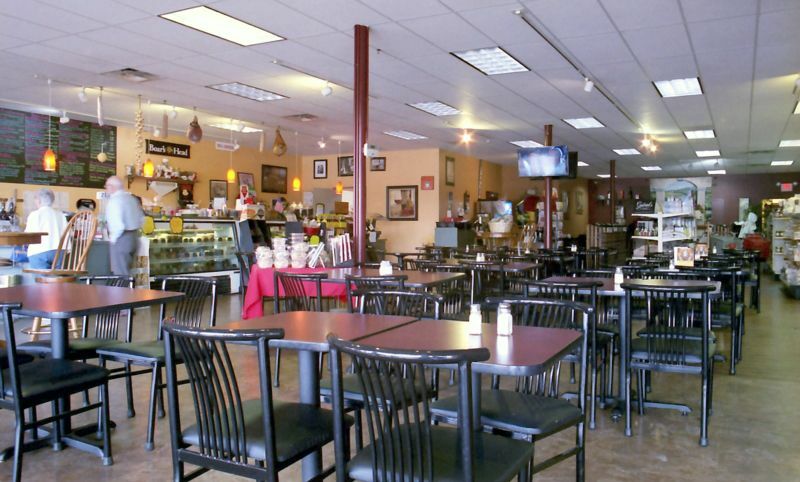 It has a nice deli where you can get ravioli salad and fresh mozzarella for a meal. Its pasta sauce is quite good, and I'm not easily impressed with the premade stuff. Viviano's is a St. Louis institution, even. 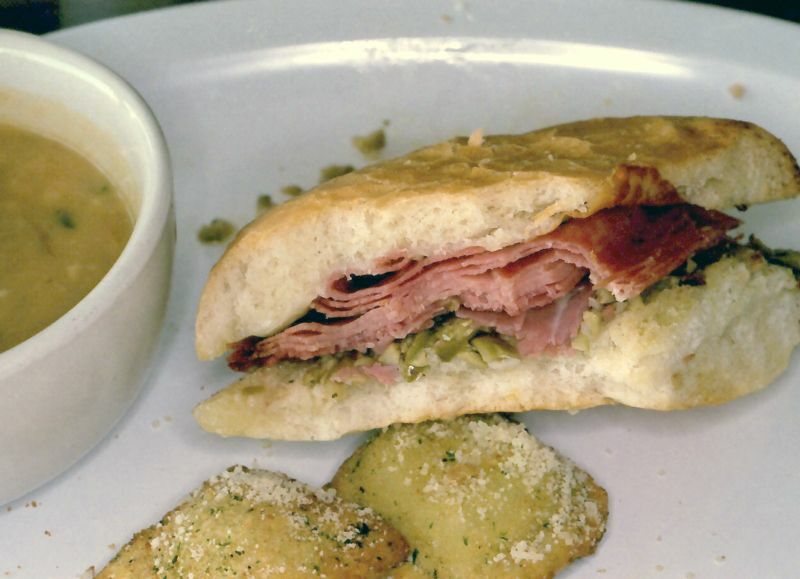 I recently stopped at the Fenton location of Viviano's Market (I'm guessing there's a family connection) for a soup-and-sandwich supper, and enjoyed it very much. The market portion isn't that large but there's a nice selection of items. The mushroom-brie soup was delicious! My sandwich choice was half of a muffuletta and it was also very good. I especially liked that the olive salad wasn't loaded with onions; I think it may have been simply olives, marinated red pepper, and a little garlic. And the bread was excellent. Feeling a little nostalgic lately? He's not like us. He's from Wisconsin. But the food looks good! So tell me...........................what are you and Joe like? For which my gratitude is infinite! I'm sure I'll make a few more visits to Viviano's in the future. The sandwich menu alone is enough to keep me occupied for quite a while! Well, we would never go for the mushroom-brie soup. More like pasta e fagiole. I got kind of sad to see posts on page 1 of this thread from Bushie and Poverty Pete. Two very dear friends that I miss. Since Viviano's is an easy drive from my hotel when I'm in St. Louis there's no doubt I'm going to be visiting fairly often. 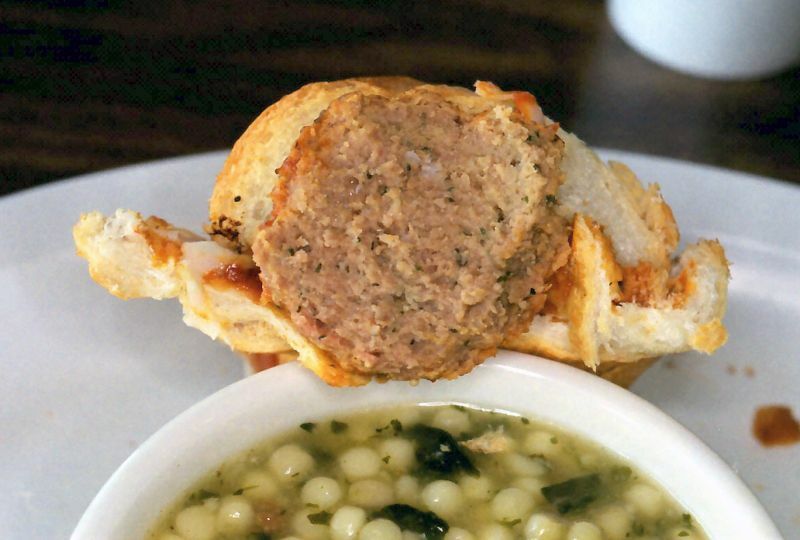 This time I had the meatball sandwich with a cup of Italian Wedding Soup. Another winner. 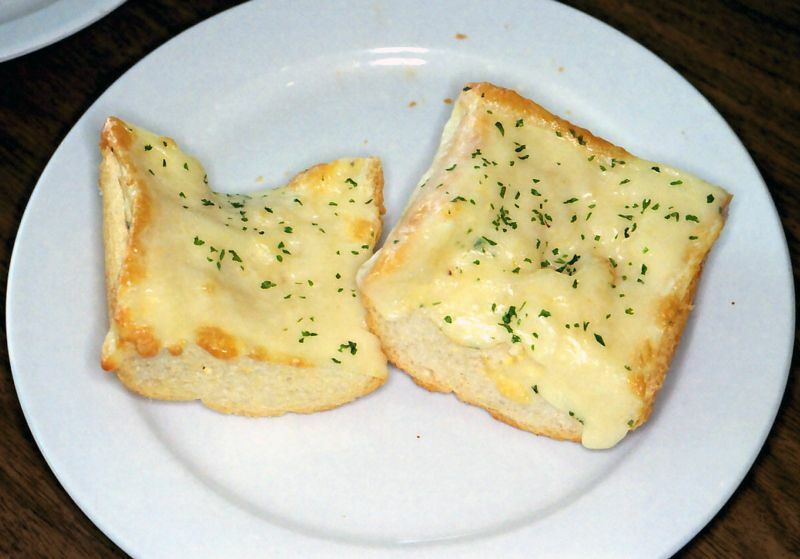 Garlic bread topped with provel. I'm still not a fan but it works better here than it does on pizza. 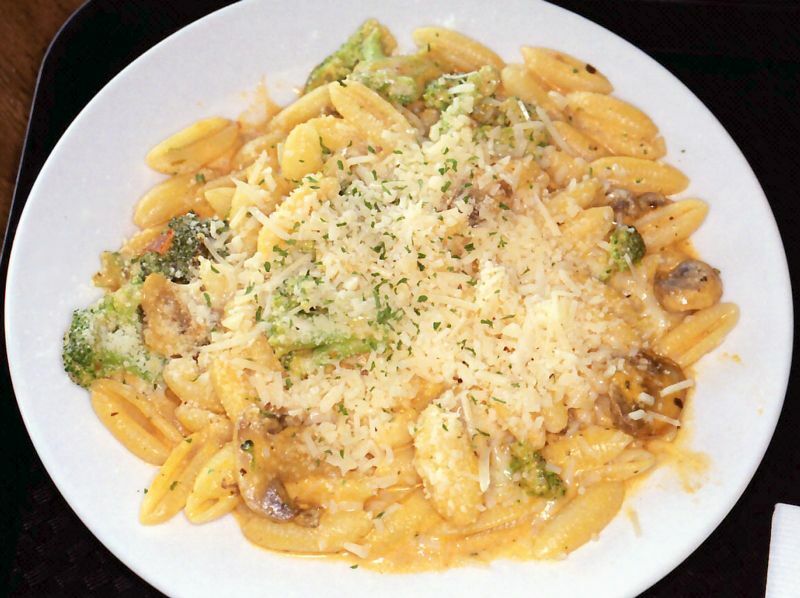 I was more hungry this time and chose a 1/2 order of pasta con broccoli for dessert. 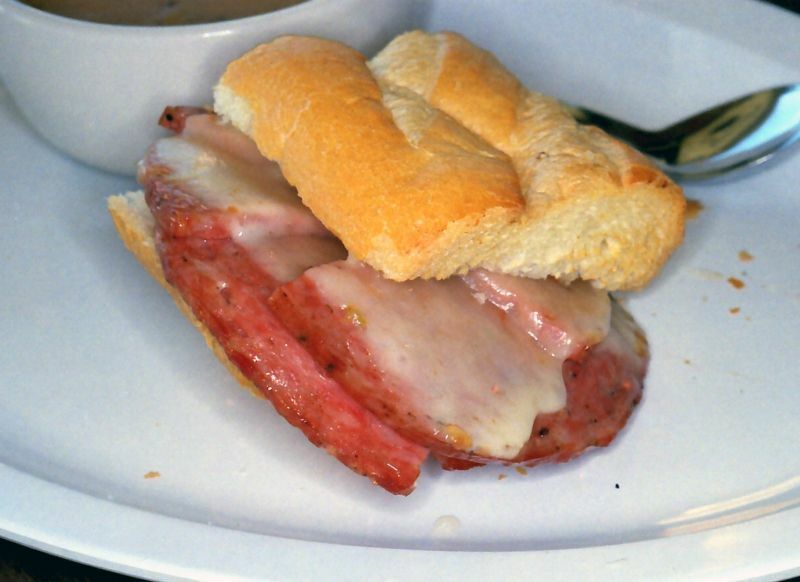 Apparently this is another St. Louis specialty and I liked it; in fact, we're hoping to have Viviano's cater lunch this coming Thursday and PCB has already been suggested as one of the choices. 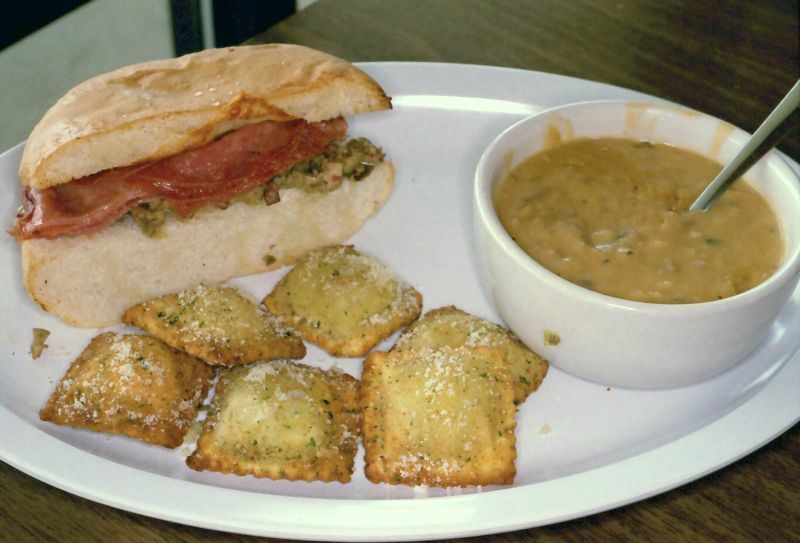 My latest visit to Viviano's was for a hot salami sandwich and some toasted ravioli. The sandwich is very simple (salami and pepper cheese on a lightly toasted crusty roll) but absolutely delicious, and I like their ravioli as well. Lee, I had a feeling you'd notice. A few weeks back I was given the task of arranging lunch for 10 of us at work, so I had Viviano's deliver some pasta con broccoli as well as a pan of salsiccia in red sauce with peppers and onions. 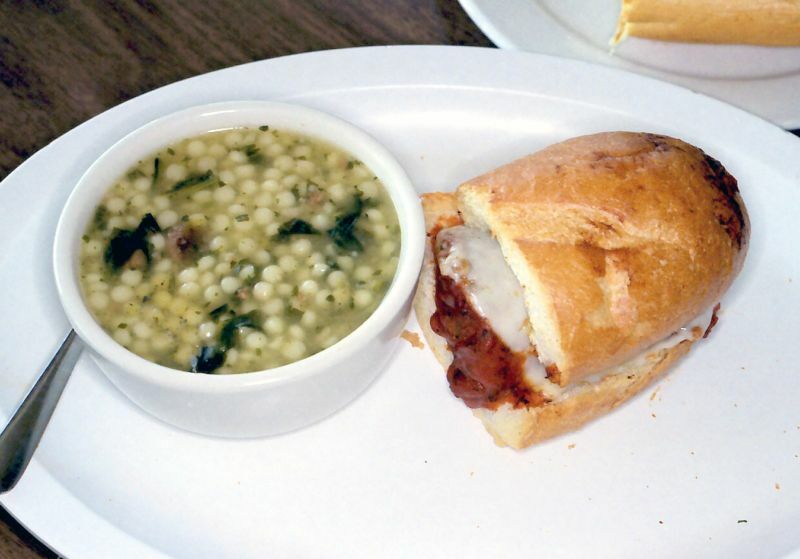 I'm back in St. Louis starting Monday and I've again been charged with lunch for one of the days I'm there, but this time there's a specific request: get it from Viviano's. It'll be salsiccia again but this time the pasta will be mostaccioli with meat sauce and I added broccoli with lemon butter in lieu of salad. Can't go wrong with any of this stuff. Good choices. Always notice good food, especially good Italian food. Monday's menu should make people very happy! 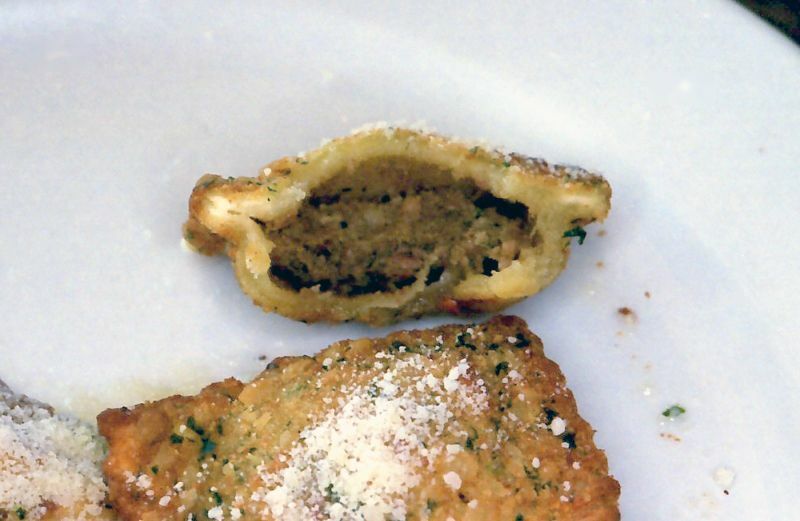 Just give me that damn Toasted Ravioli....my favorite part of spending time there. I ate a long time ago at Favazza's on the Hill and I see they are still in business. It was probably better at the time than I experienced Italian in the Twin Cities. I worked with a Favazza at Target in the Twin Cities that turned me on to this place during a business trip. Caveat. It was about 20 years ago. 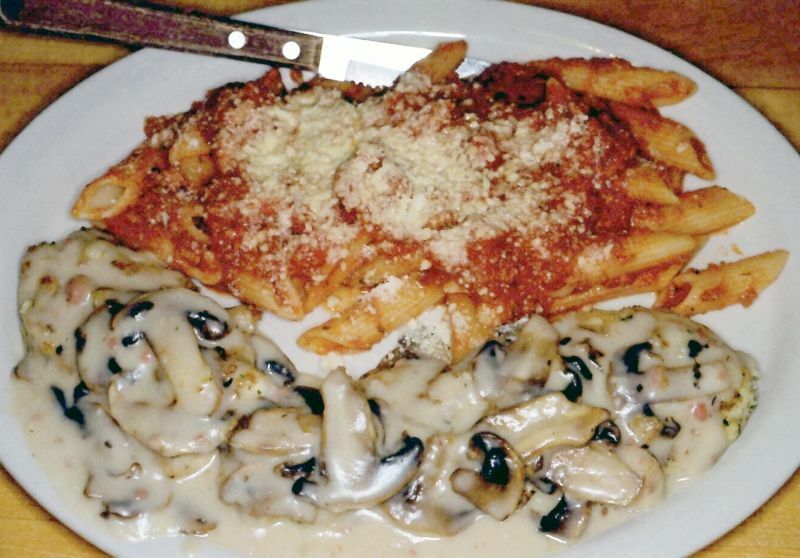 Last month my coworker/dinner companion and I ate at the Crestwood location of Rich & Charlie's, a St. Louis fixture since 1967 that has close family ties to the Pasta House Co. string of restaurants. 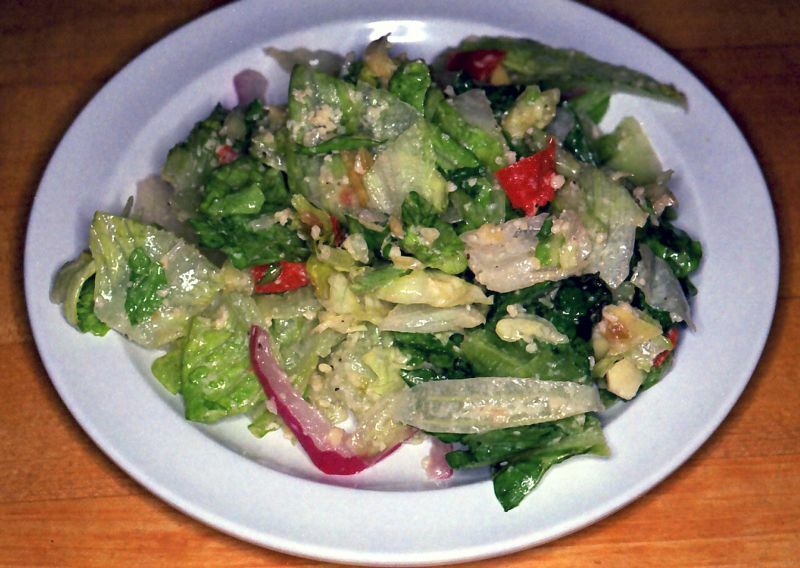 Chris' dinner came with the house salad and regionally famous Rich & Charlie's dressing, and she really liked it. Her Shrimp Tuscany. 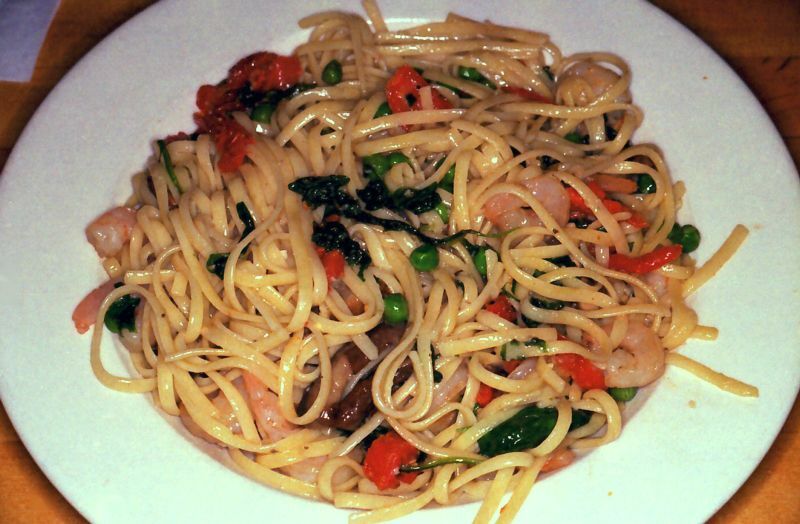 I didn't taste the pasta but the shrimp were very good. My Chicken Spedini Marsala was also very good, especially the sauce. I added pasta and red sauce as my side and it would've been fine as an entree as well. We're back in St. Louis next week so another visit to Rich & Charlie's just might be in order. Oh, for that Shrimp Tuscany!!! 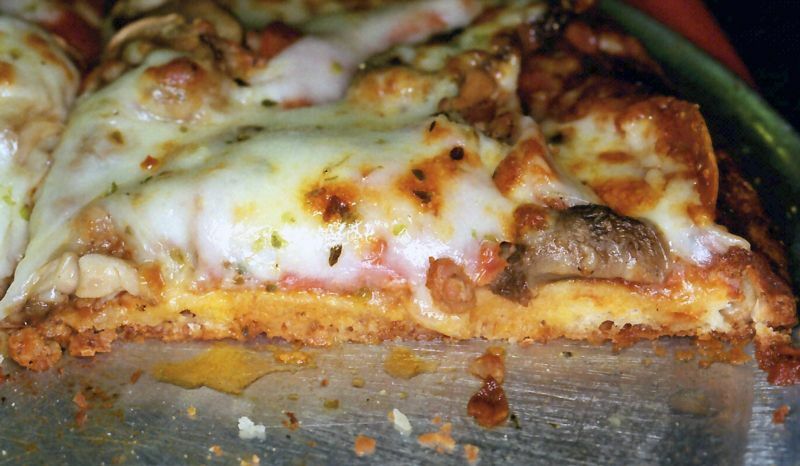 When I was in St. Louis last month I returned to Viviano's for the first time in awhile, and this time I tried the pizza. No, that's not Provel. 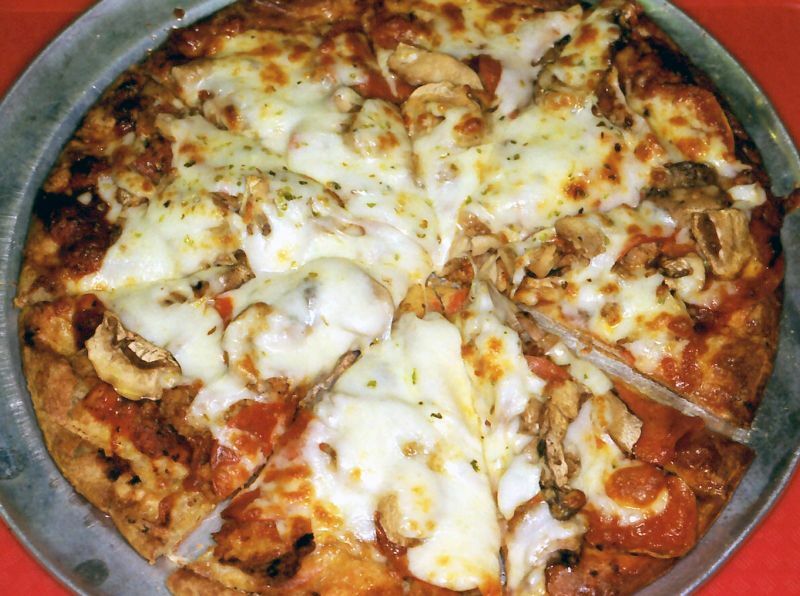 Viviano's uses a blend of mozzarella and provolone and it makes for an excellent pizza! My coworker and frequent dining companion Chris agreed and when we're back in MO next week she wants to go there just for pizza. Brad, Your killing me with all this awesome food and pics. Although, you might have to change your handle to "ScreamingEyetalian".